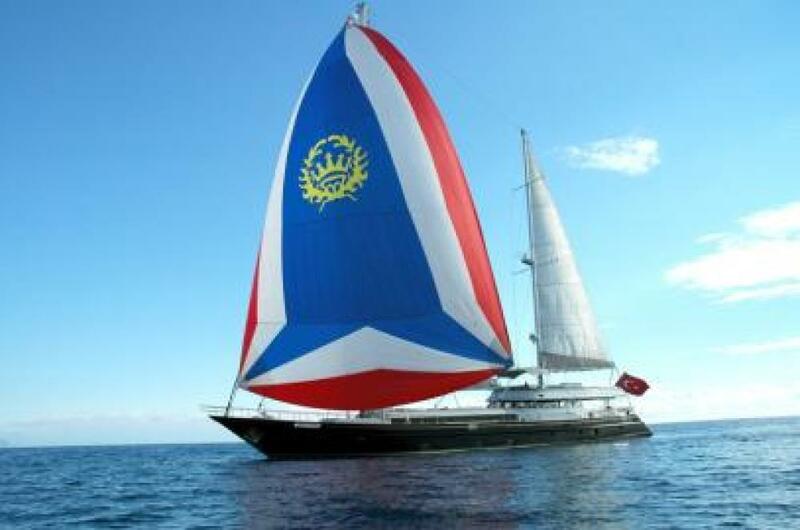 SUHEYLA (EX SUHEYLA SULTAN) was built in 1990 and refitted in 2008. 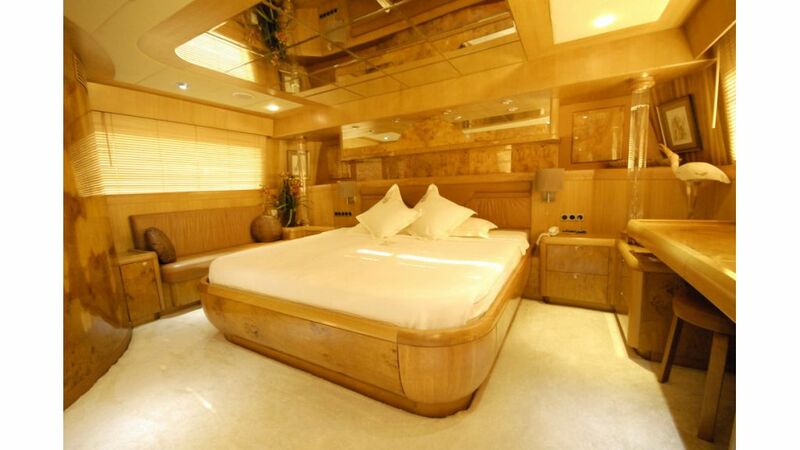 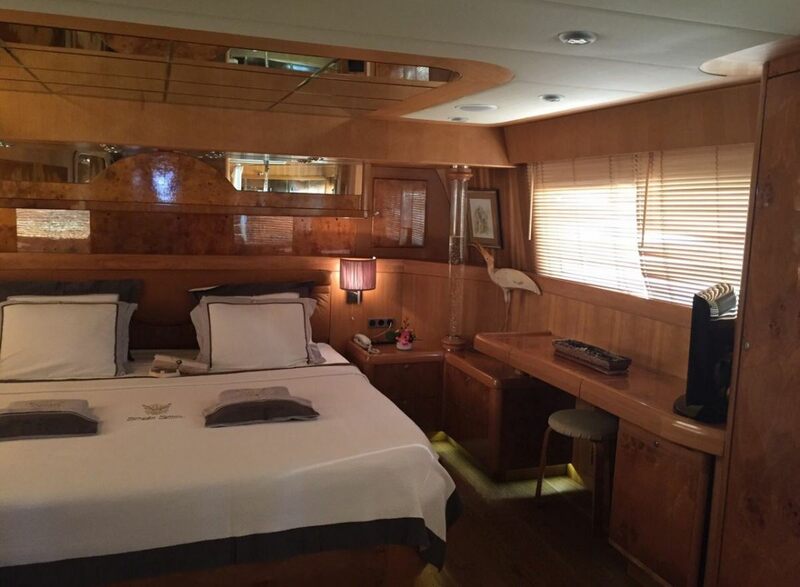 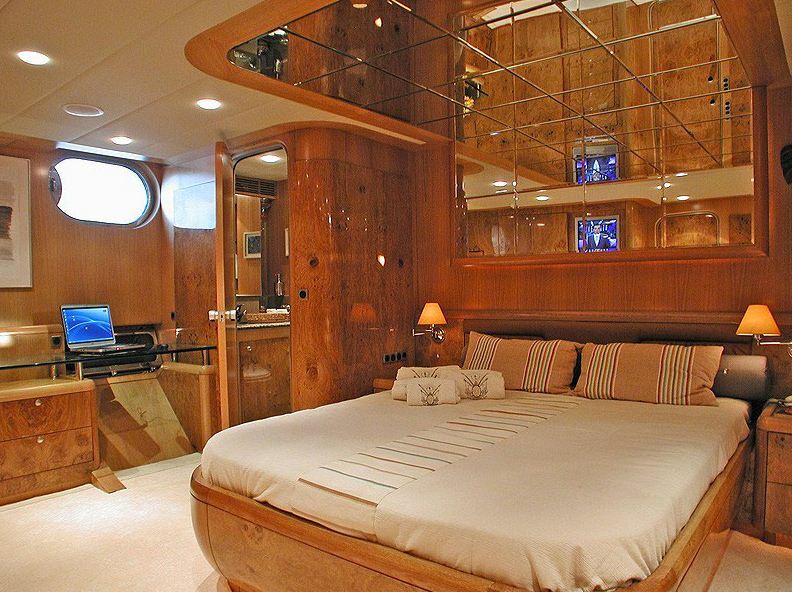 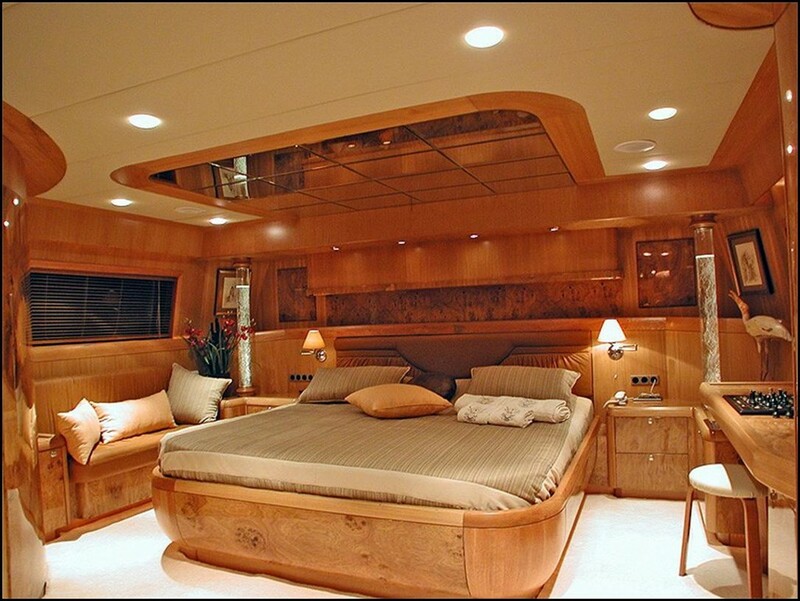 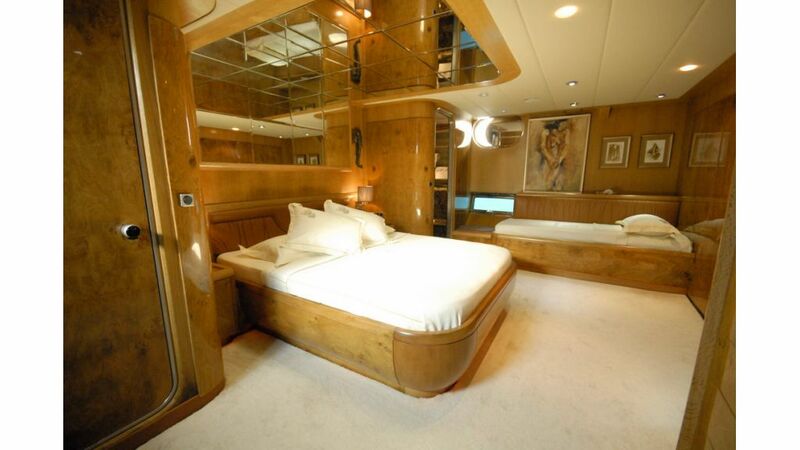 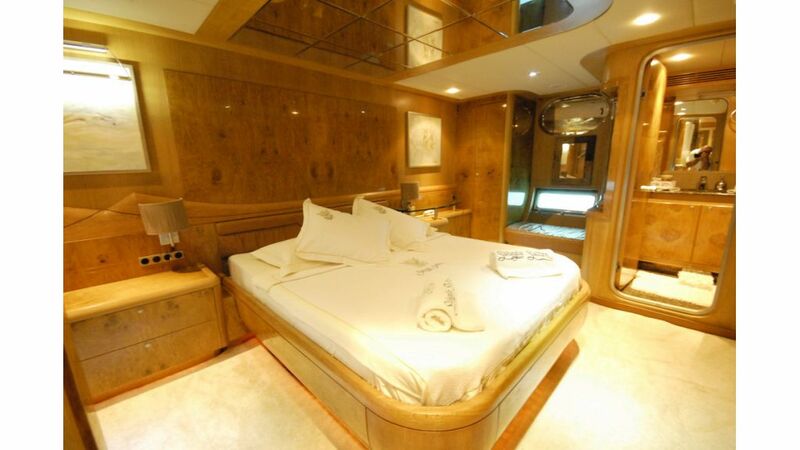 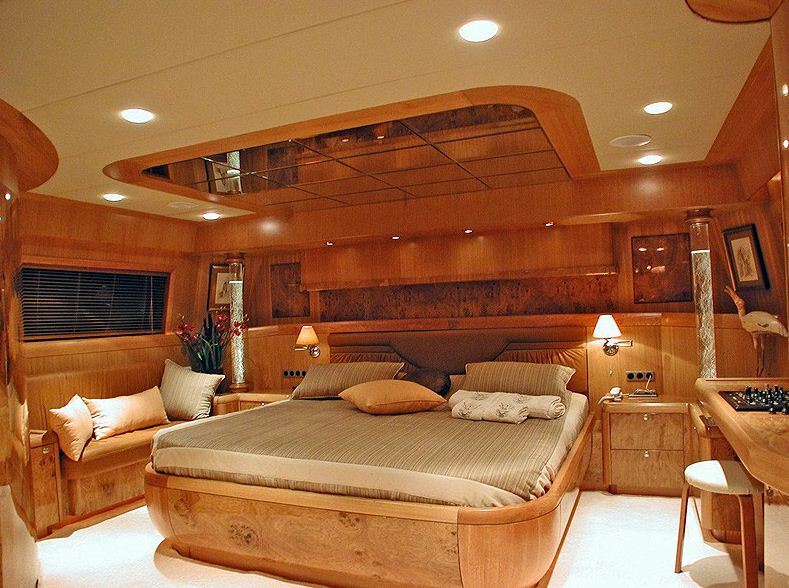 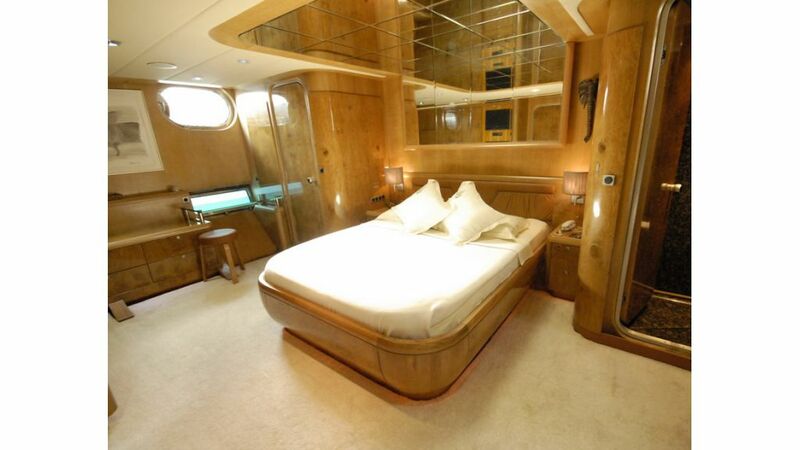 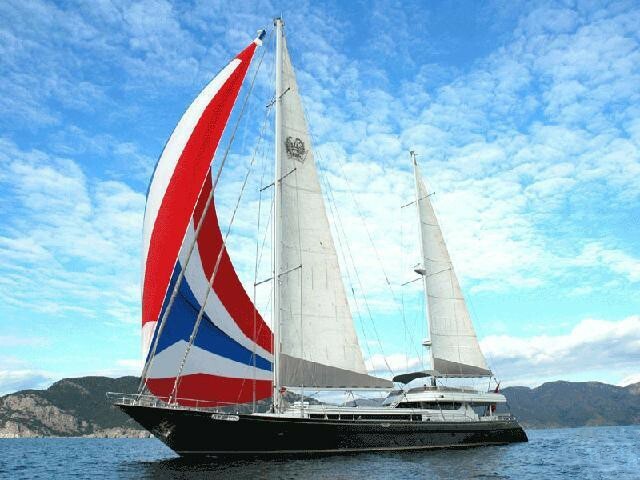 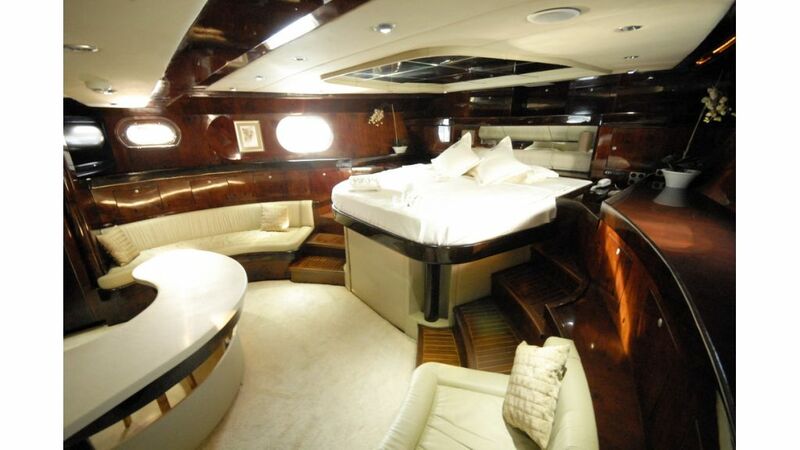 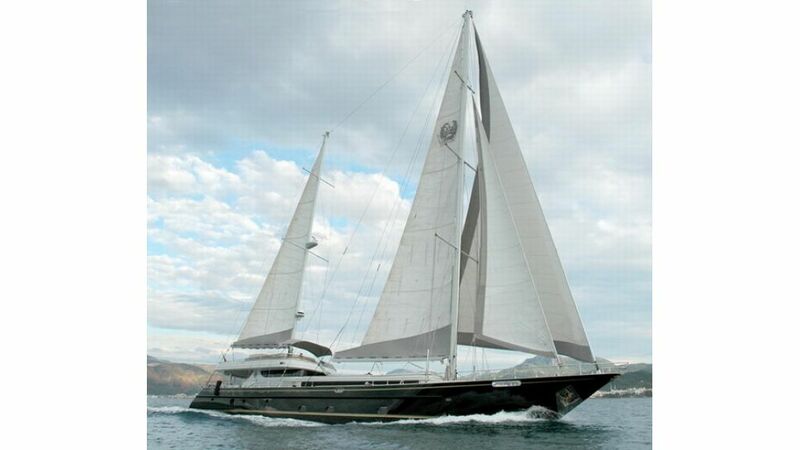 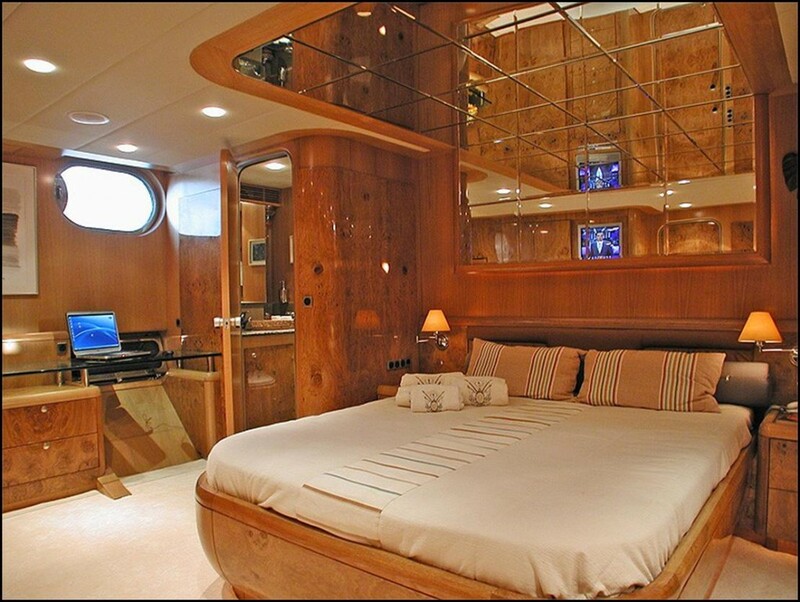 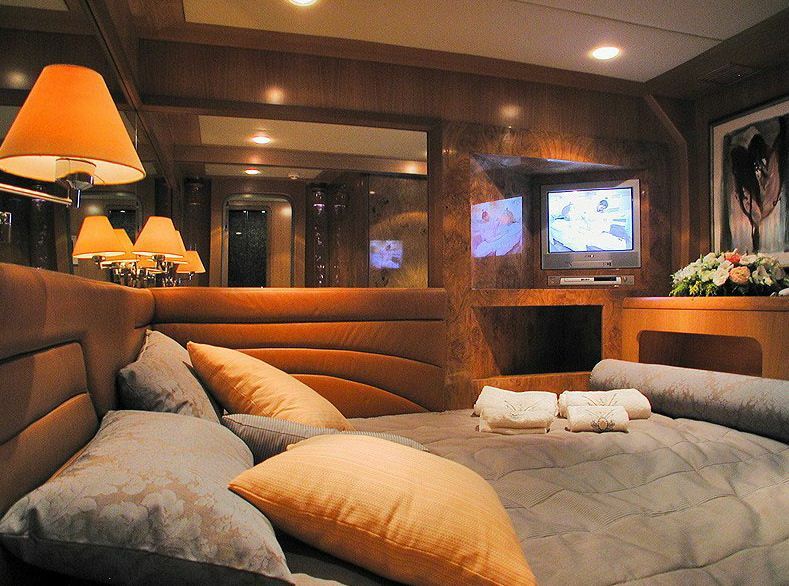 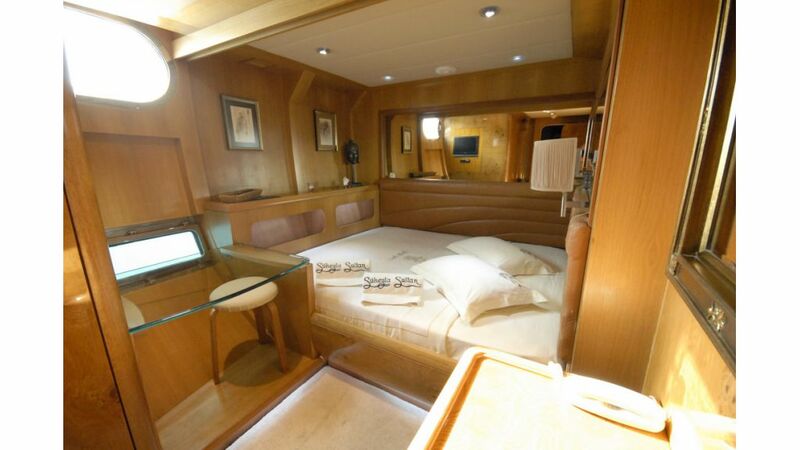 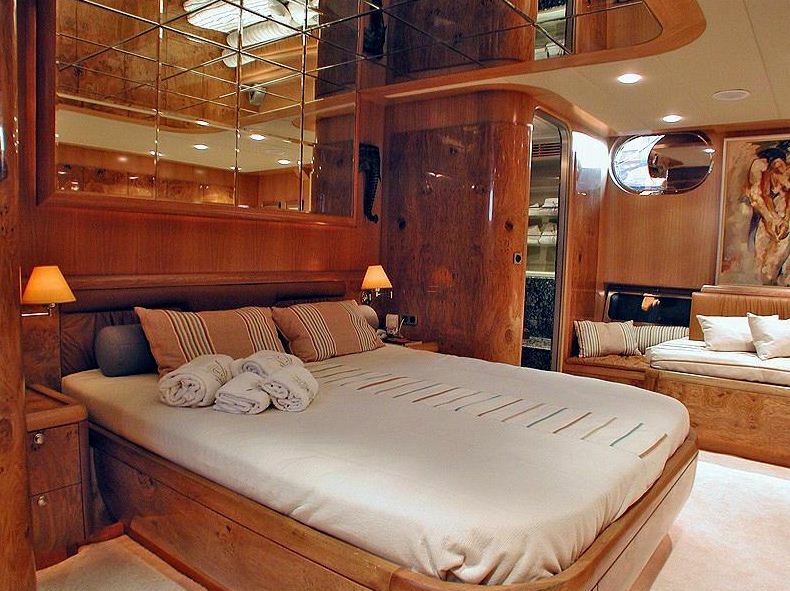 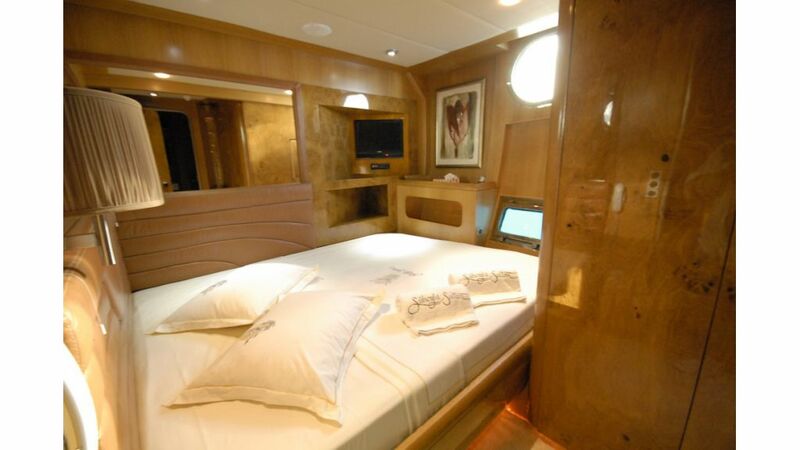 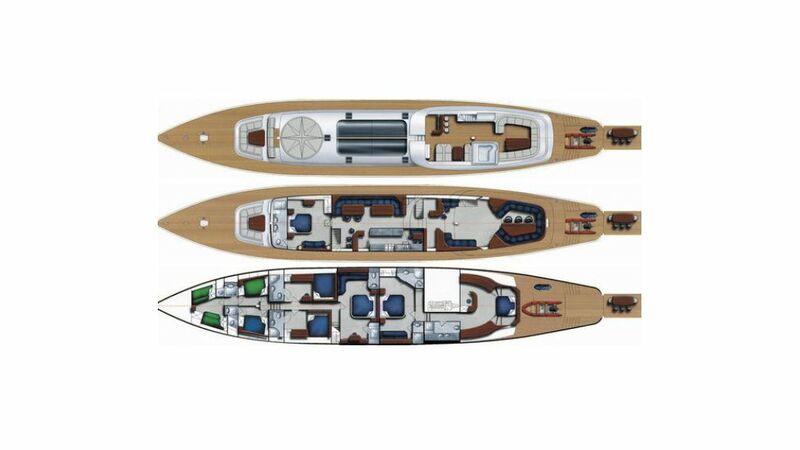 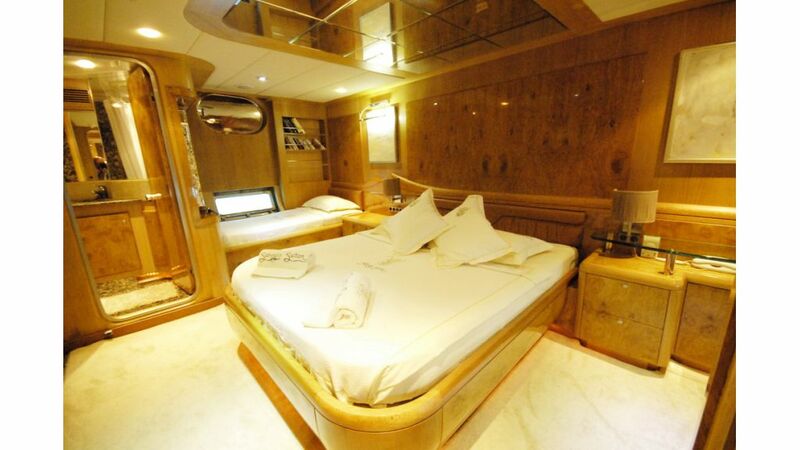 The yacht measures 40 meters (131ft) and can accommodate up to 12-14 guests in 6-7 deluxe en-suite cabins. 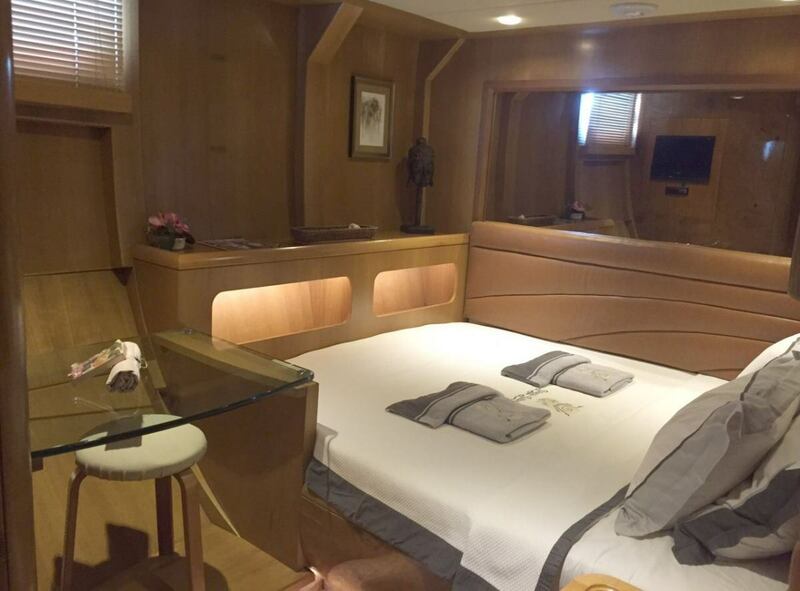 SUHEYLA'S NOTABLE FEATURES: Spa Pool tub ~ 18m² Folding swim platform ~ Rotating sun deck ~ Underwater windows and lights ~ Projection screen and cinema ~ Great water toys ~ Fabulous accommodation areas. 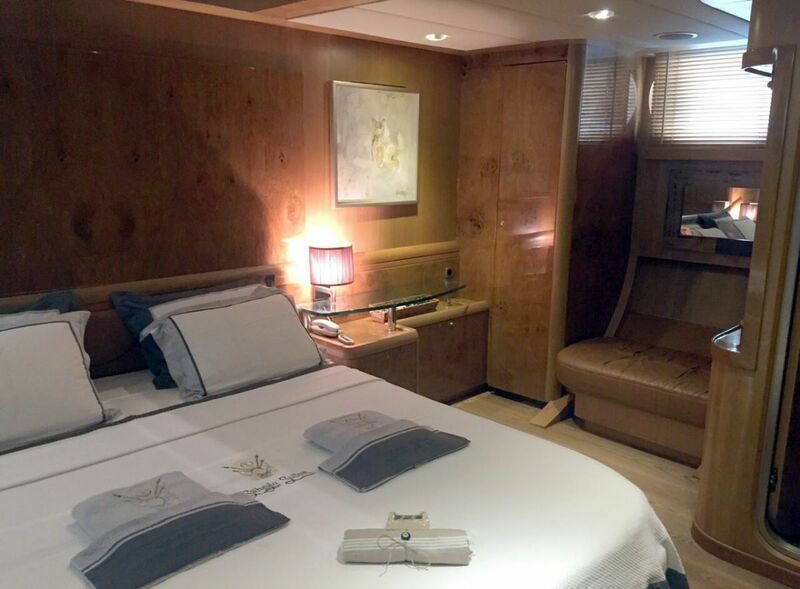 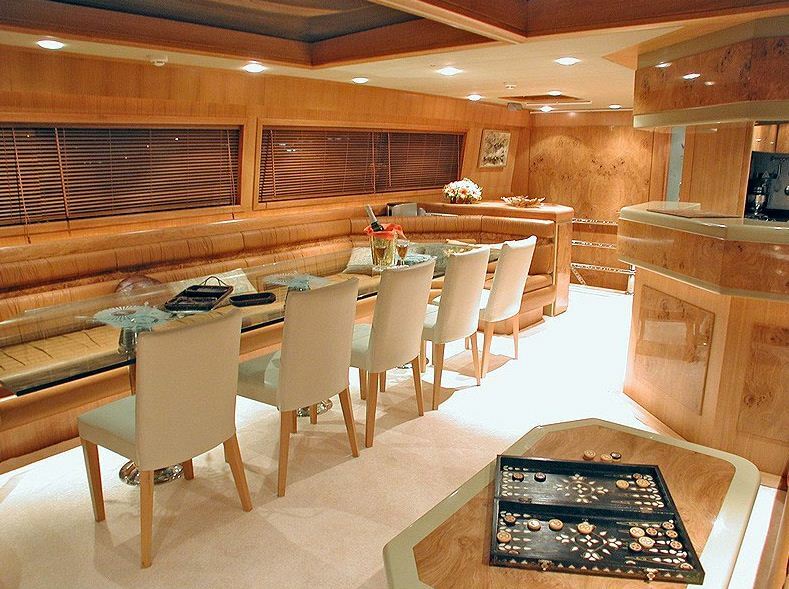 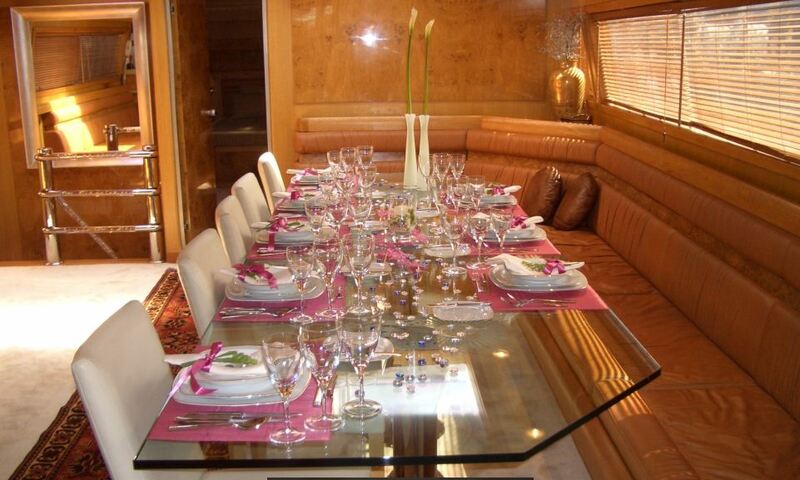 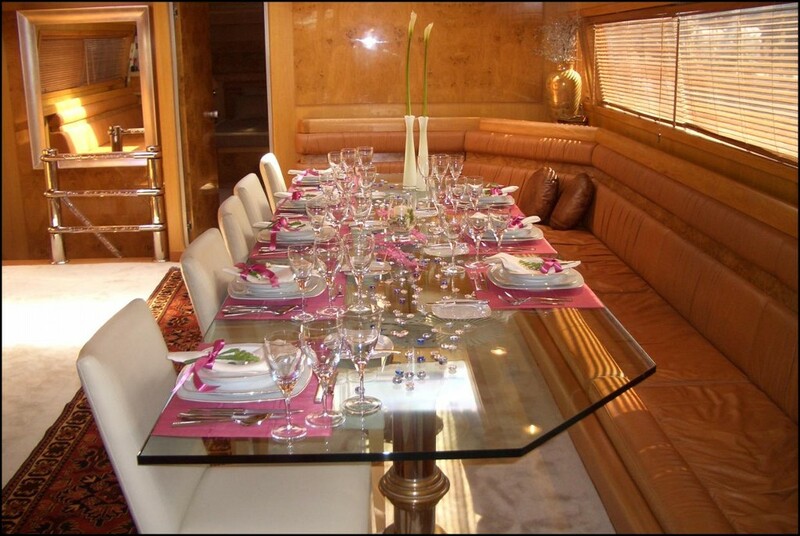 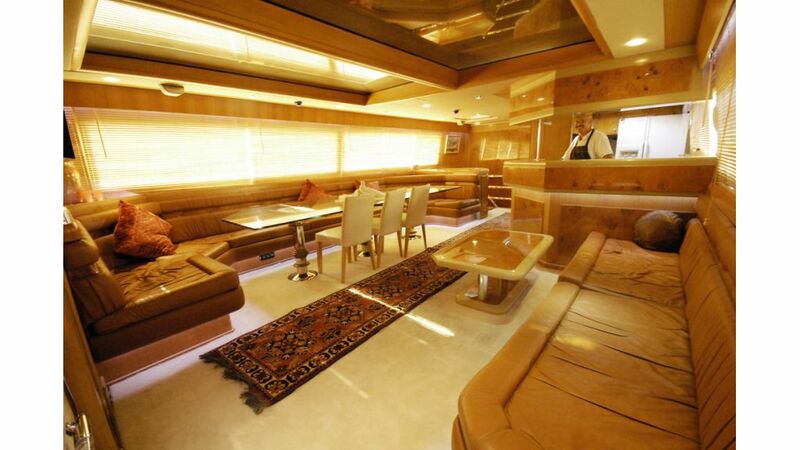 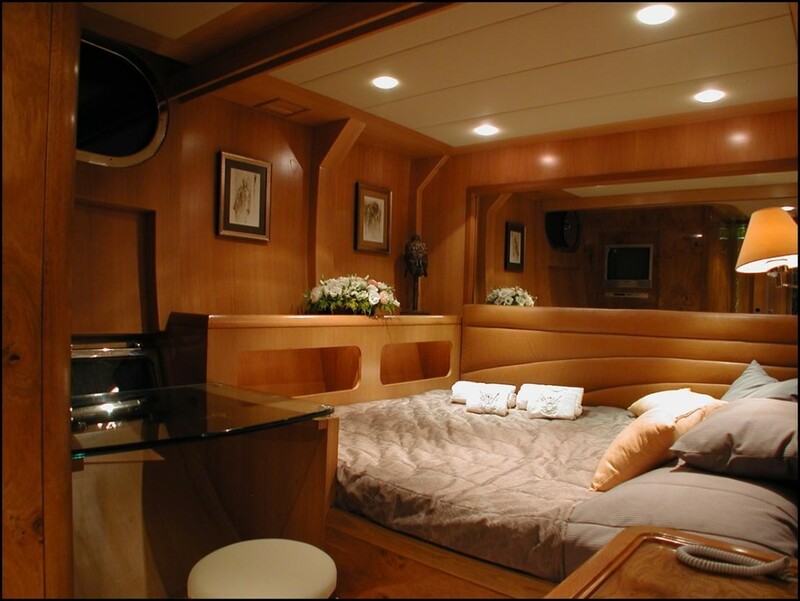 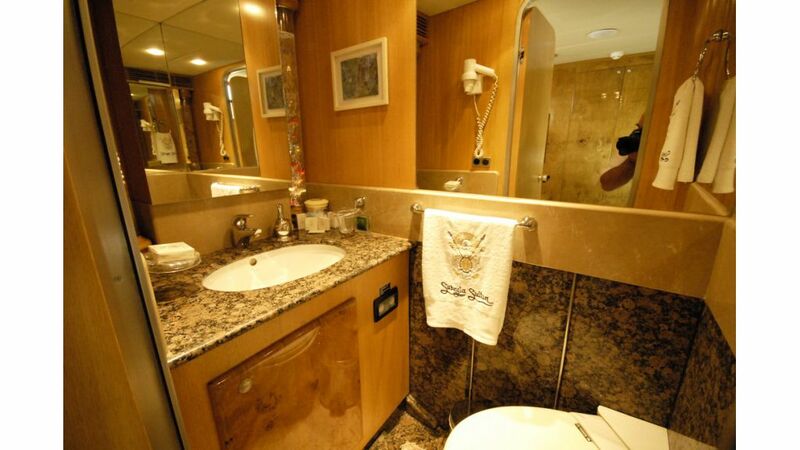 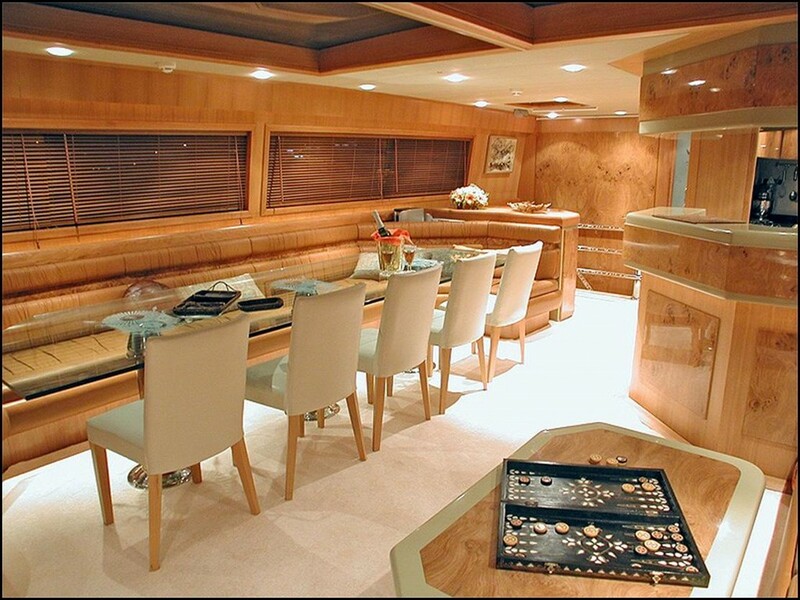 Her interior is bright and spacious with a minimalistic yet elegant vibe; the salon features light high gloss woods, a beautiful glass formal dining table with cream leather seating on the starboard side and a cocktail bar adjacent to the galley on the port side. 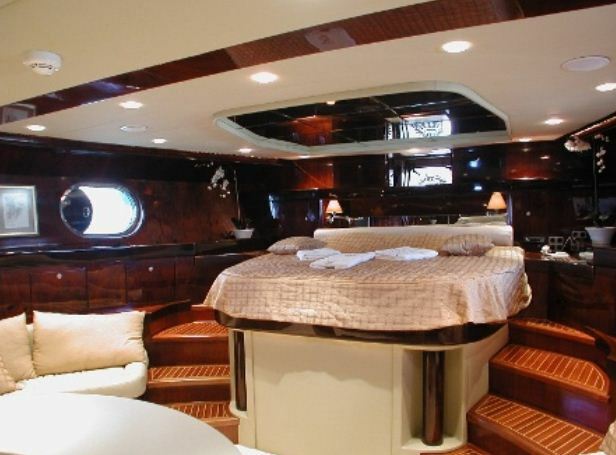 Fore to aft windows and a large overhead skylight provide ample natural light. 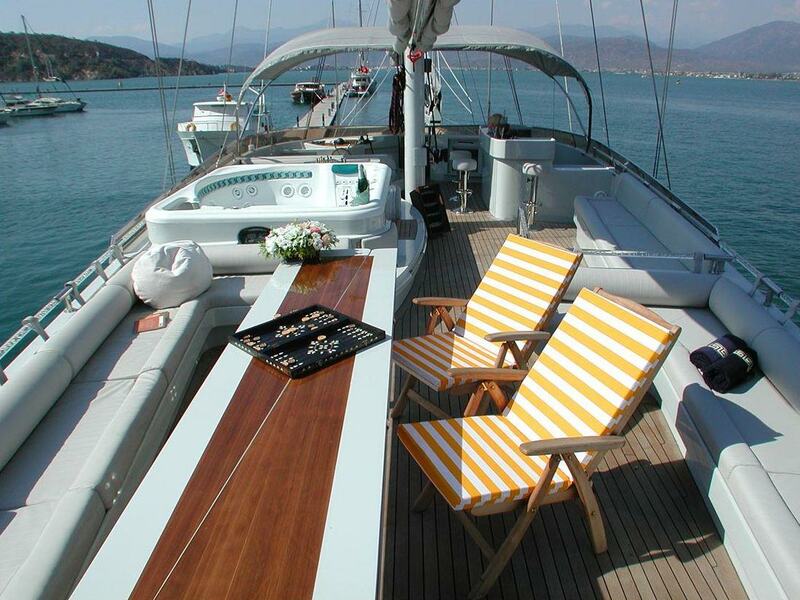 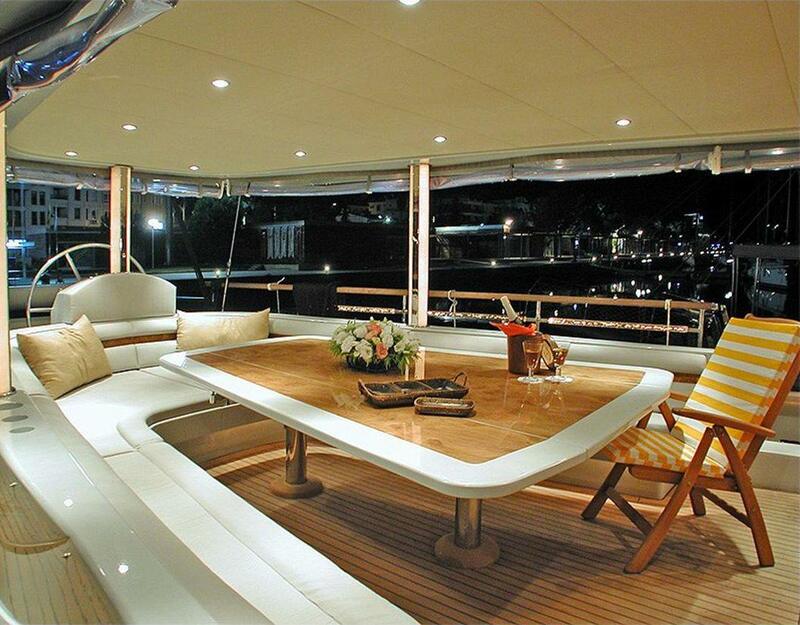 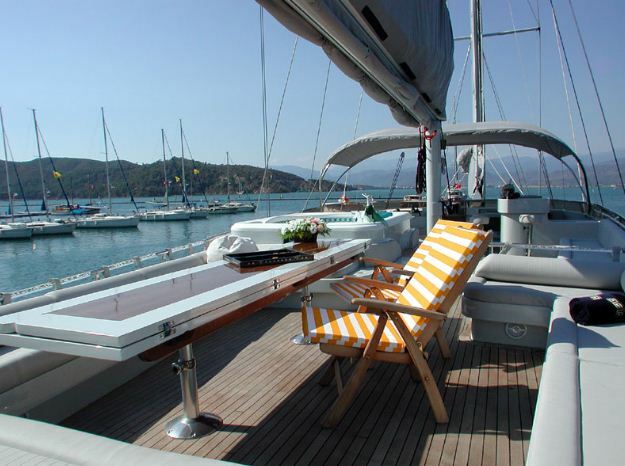 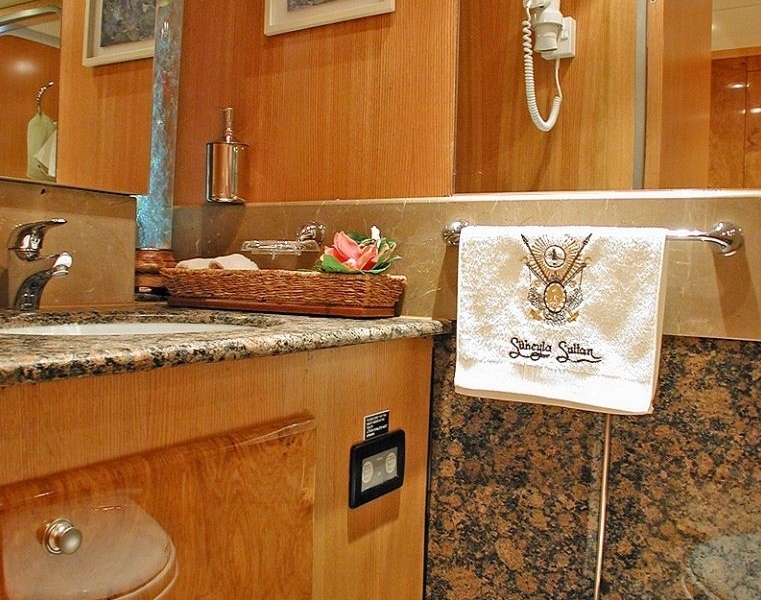 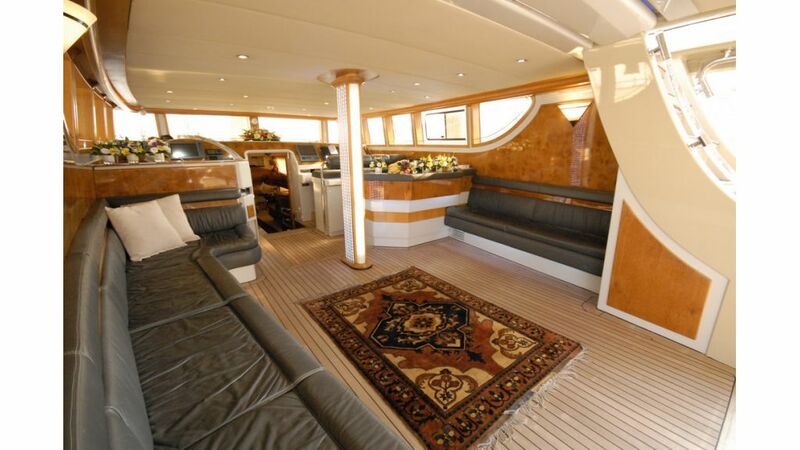 SUHEYLA SULTAN also offers guests plenty of areas on deck to relax and enjoy. 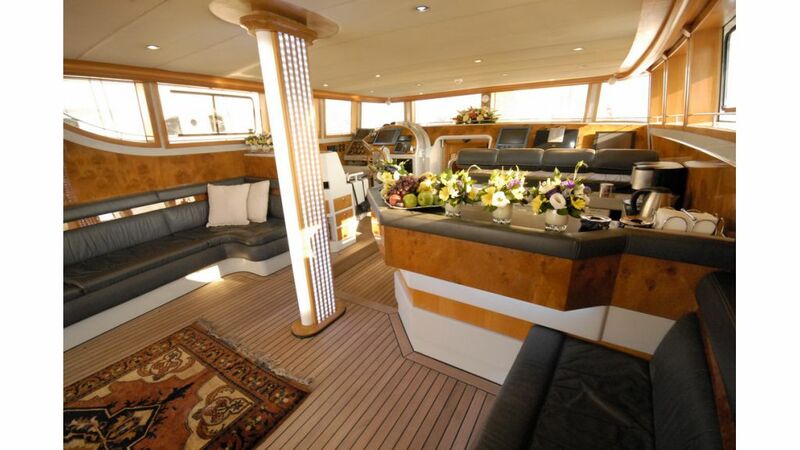 The aft deck is perfect for entertaining and offers an alfresco dining option, cocktail bar and additional seating, forward is another alfresco dining option under the stars. 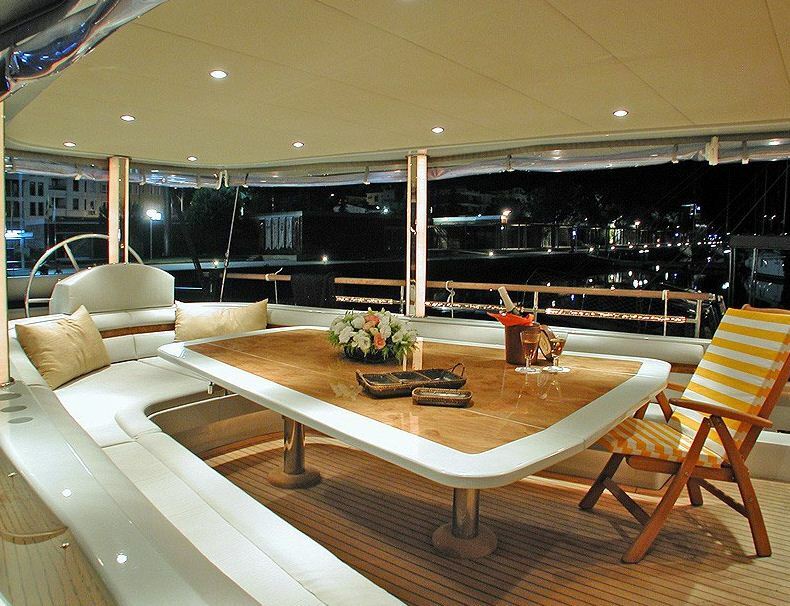 Above decks, the flybridge boasts a sundeck area with another alfresco dining option, cocktail bar with seating and a Spa Pool tub. 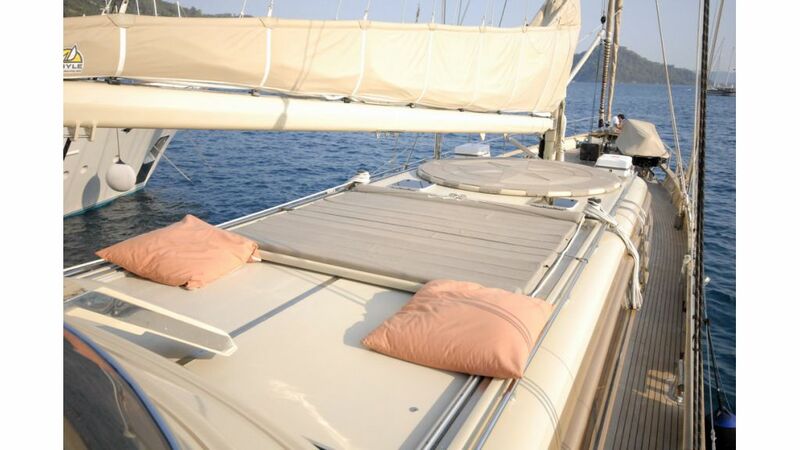 Aft an 18 meter squared folding swim platform is ideal for water activities. 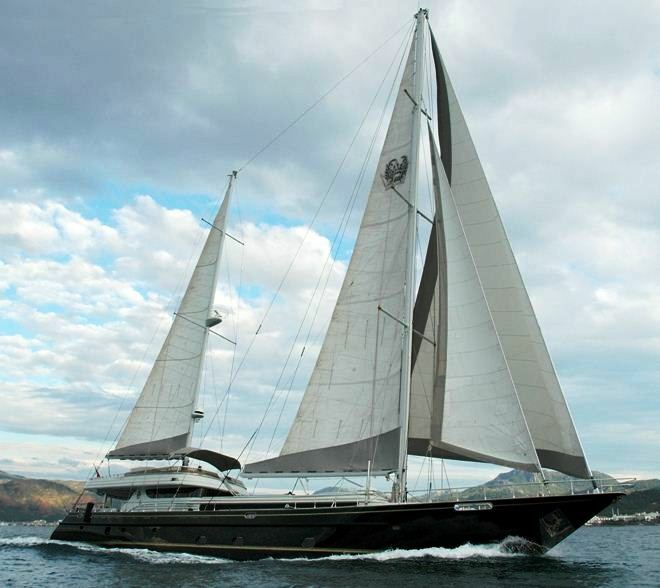 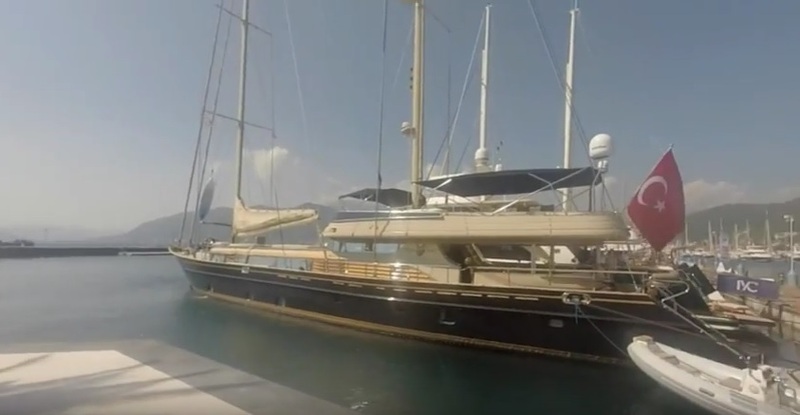 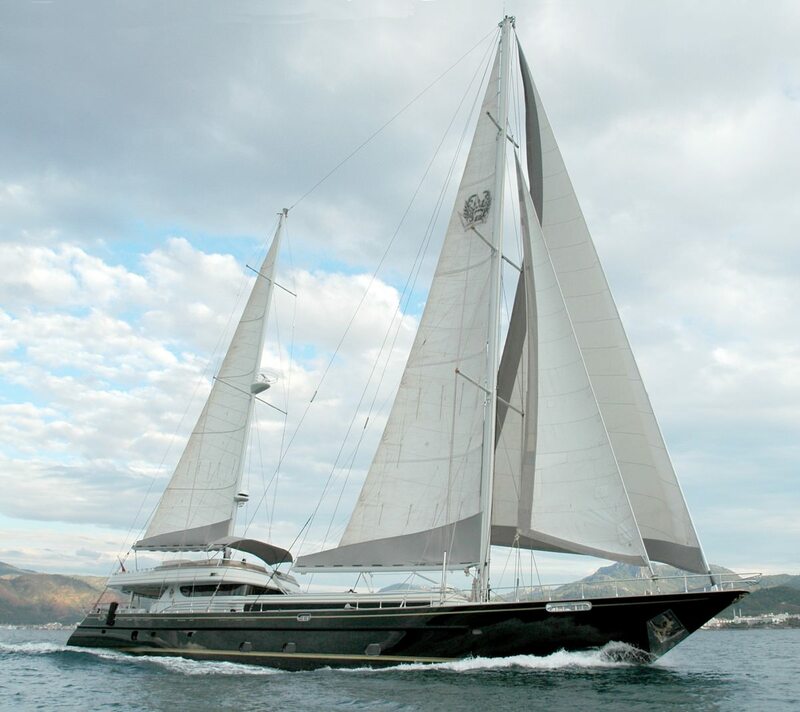 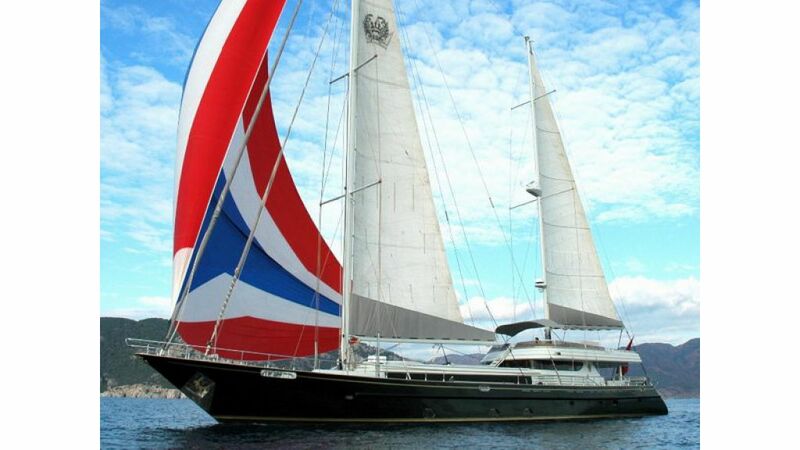 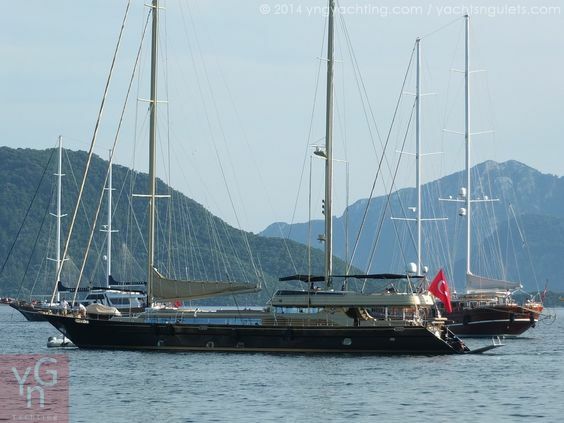 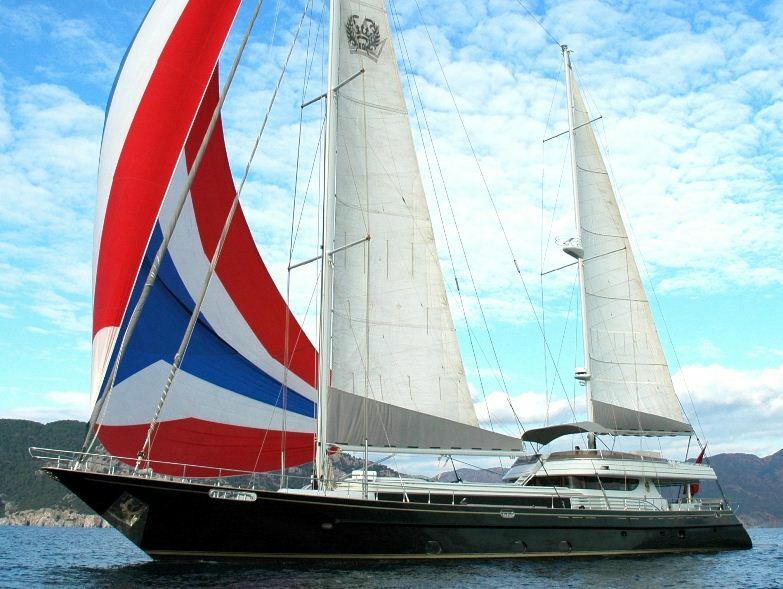 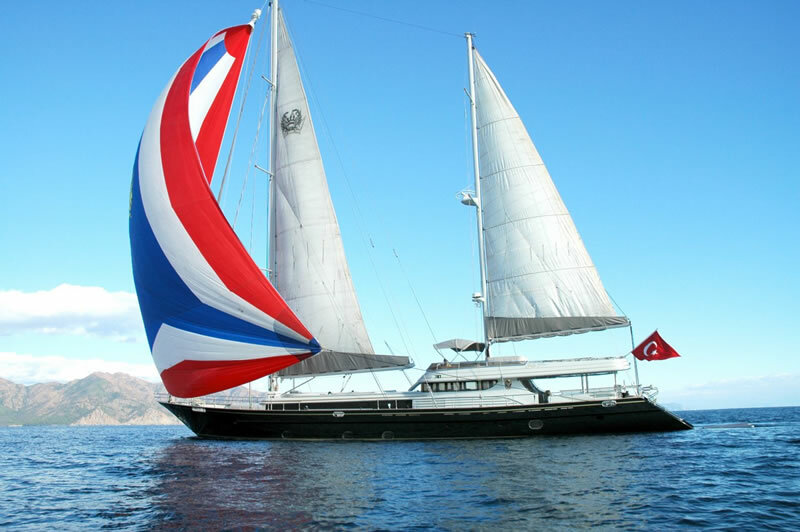 SUHEYLA has a beam of 6.4 meters (21ft) and a draft of 2.8 meters (9ft), she cruises at speeds of 9 – 11 knots. 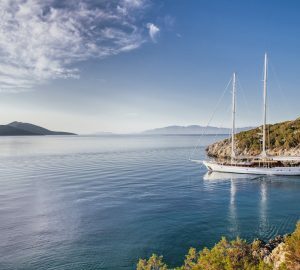 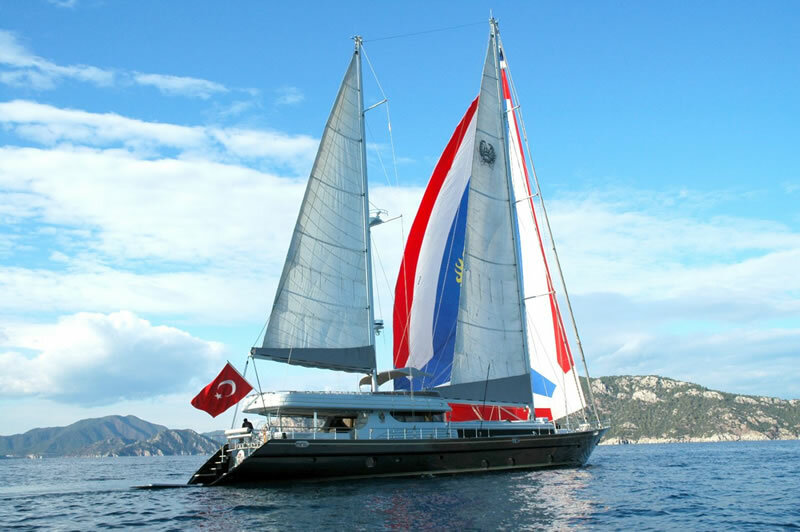 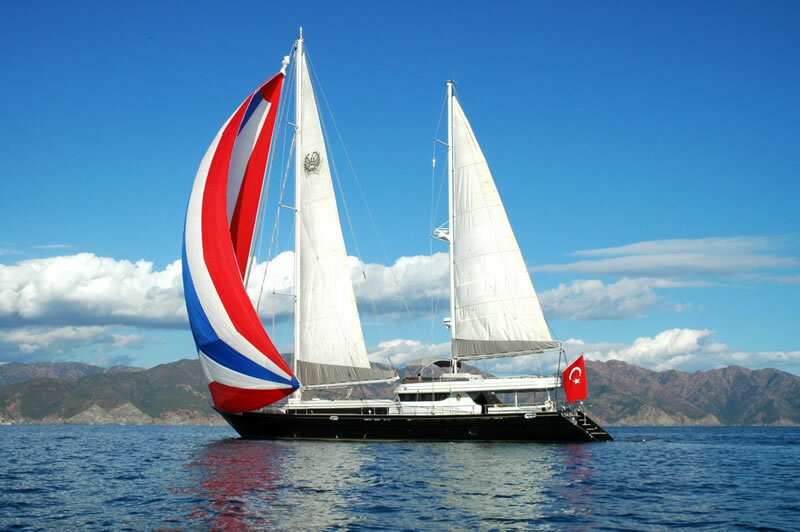 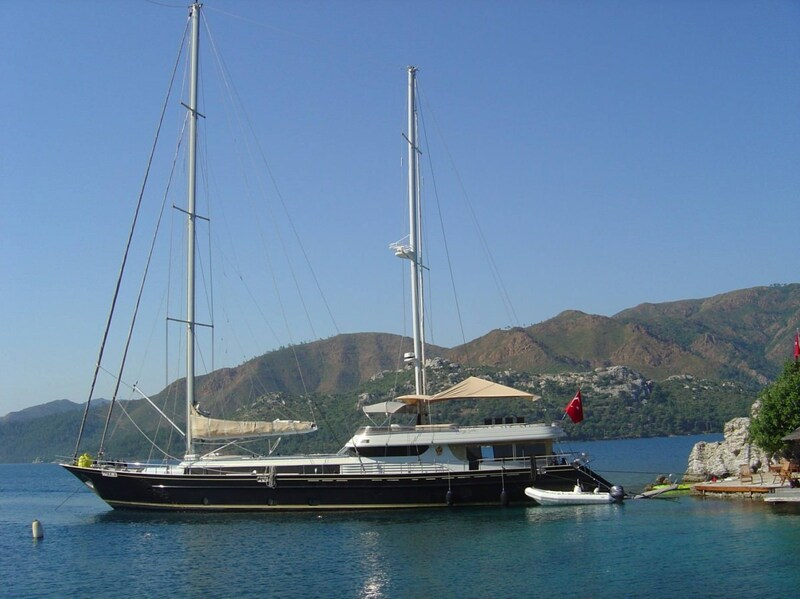 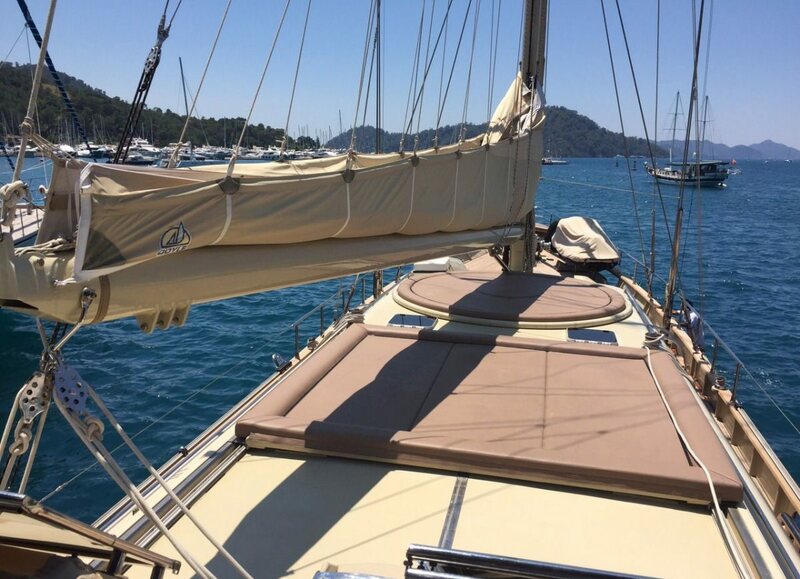 Gulet SUHEYLA offers fabulous accommodation for up to 12-14 guests in 6-7 cabins. 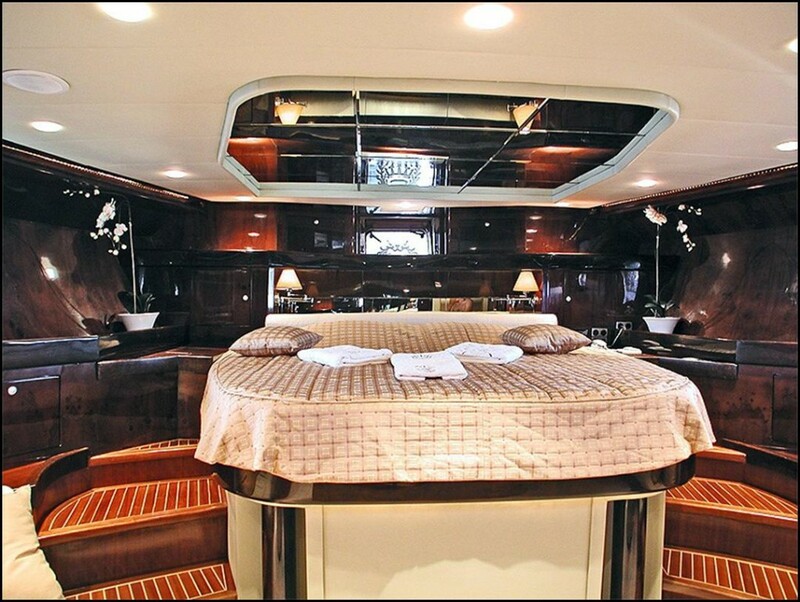 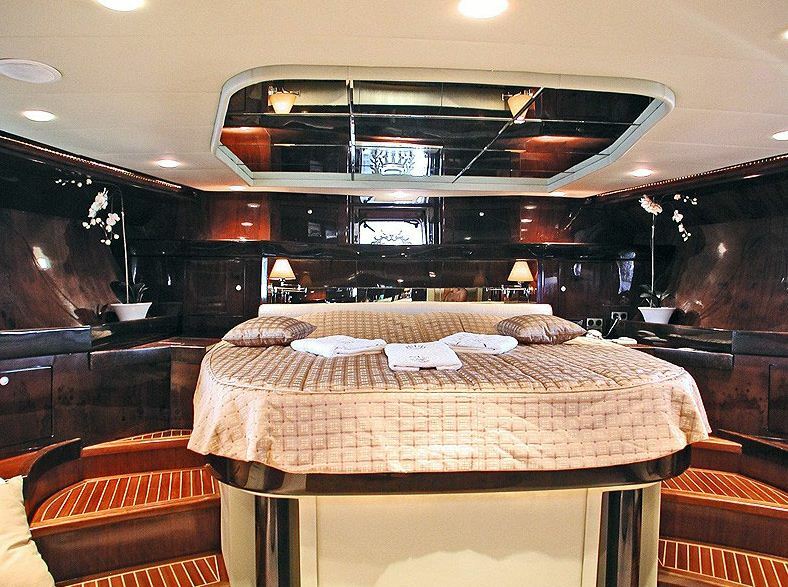 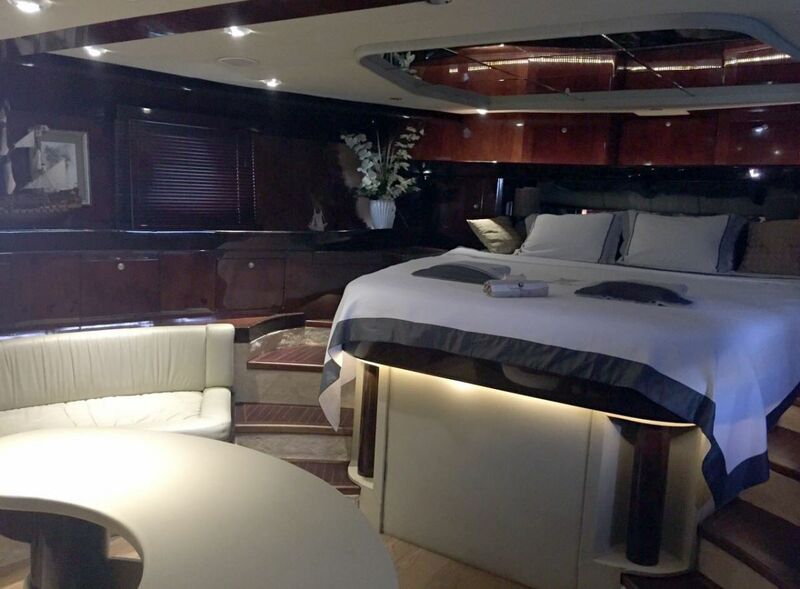 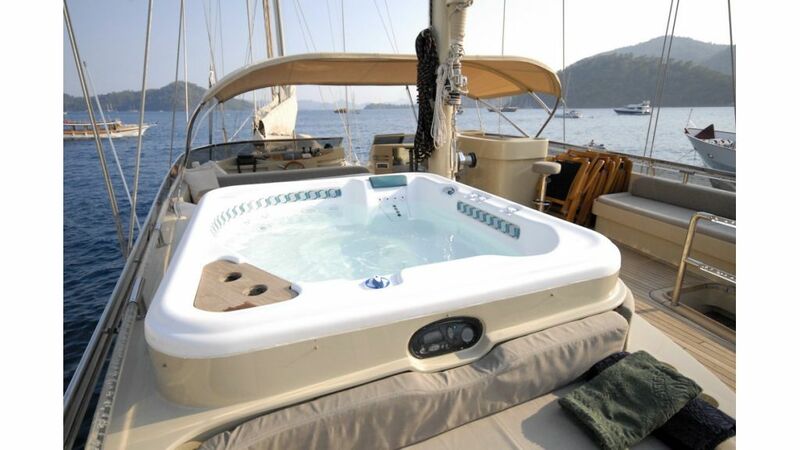 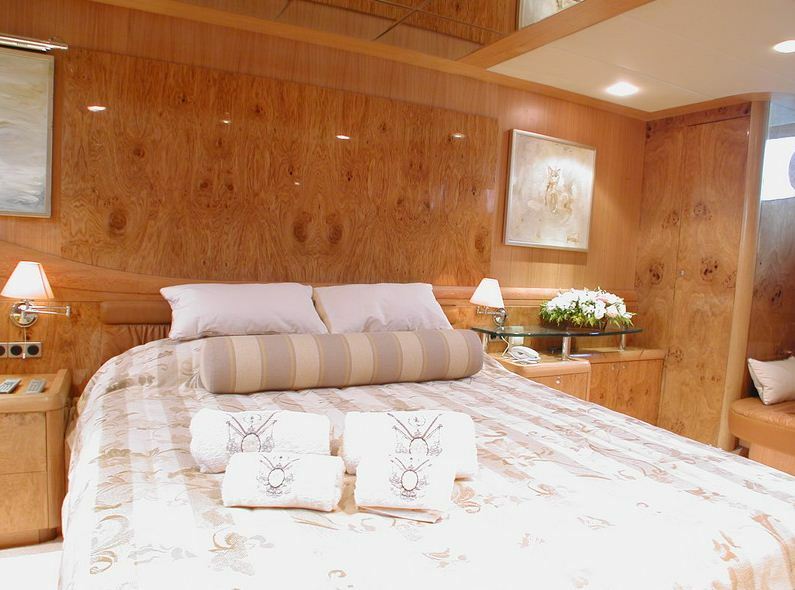 On the main deck full beam of the yacht and forward is the master suite with a king size bed, sofa, vanity and en-suite facilities with hot tub. 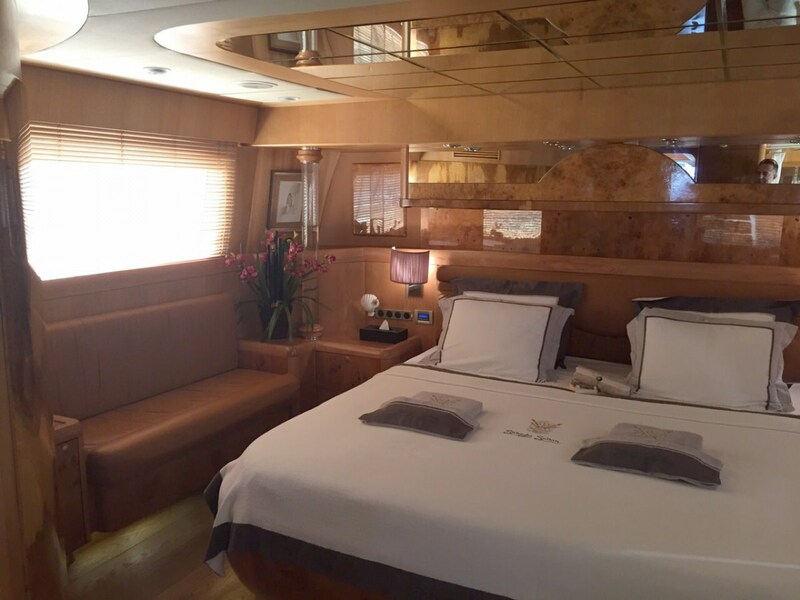 There is a second master on the lower deck full beam of the yacht and aft, offering a king size bed, sofa, vanity and en-suite facilities. 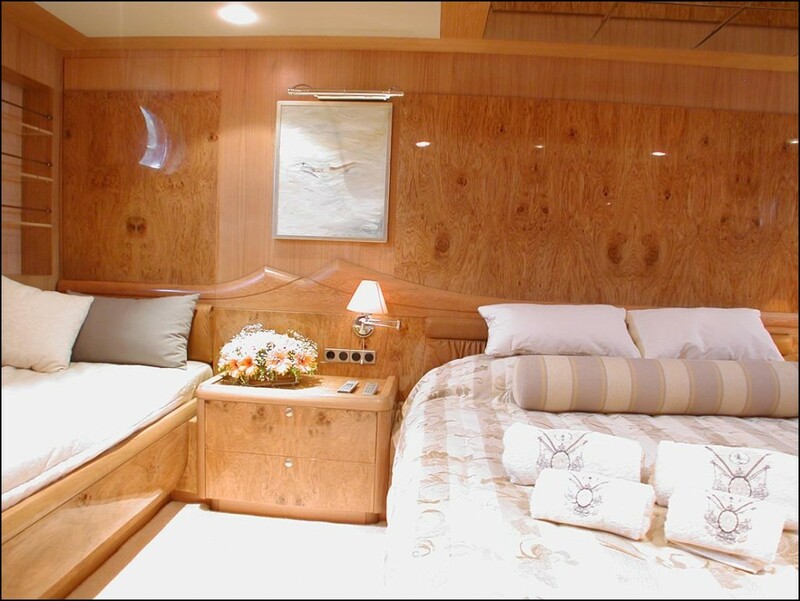 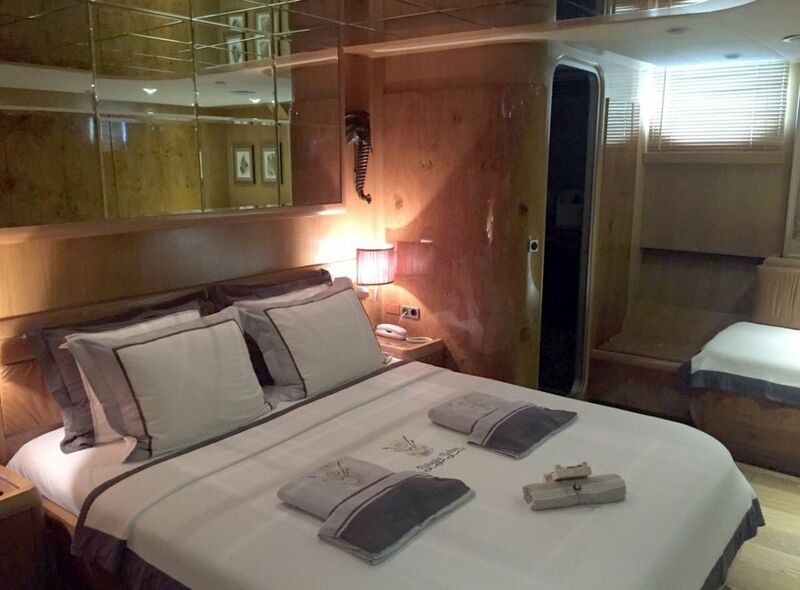 2 double cabins with king size beds, sofas, vanities and en-suite facilities are both full beam of the yacht amid ships, while a further 2 cabins with king side beds are port and starboard (one with a single bed) with en-suite facilities. 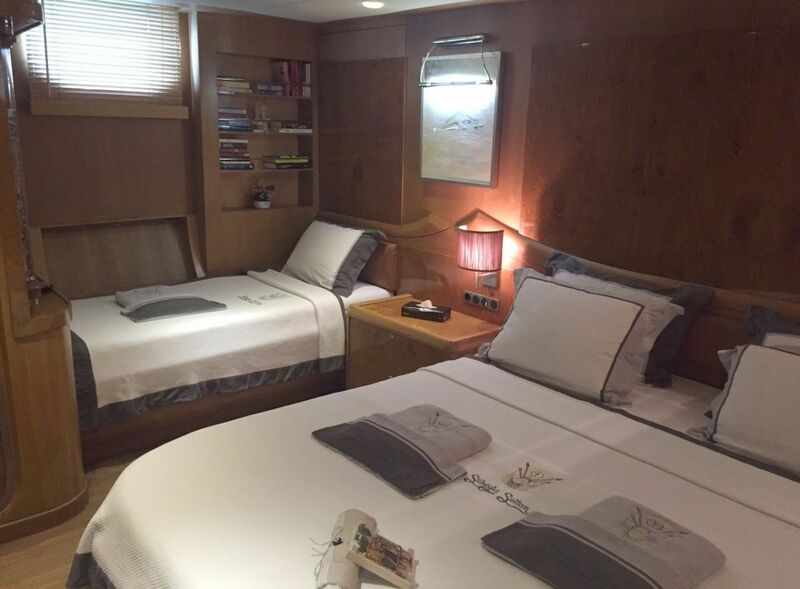 An optional bunk bed cabin is also available. 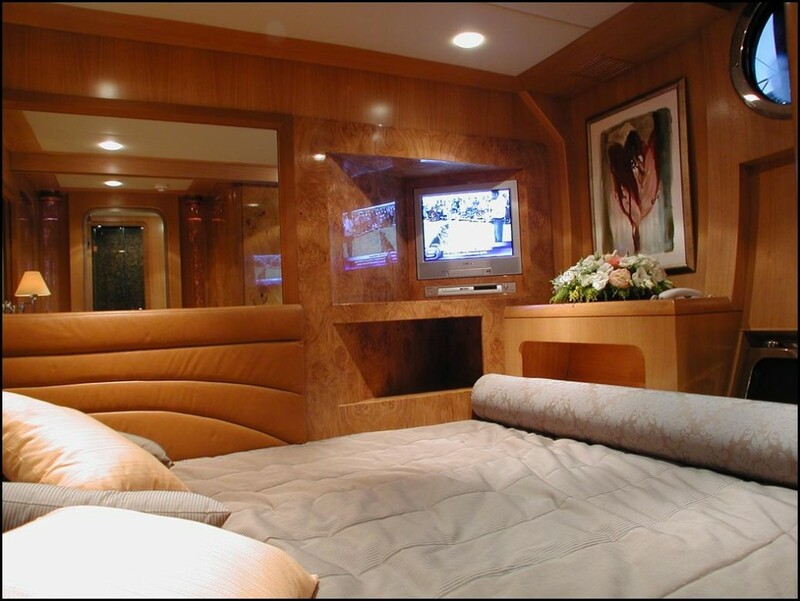 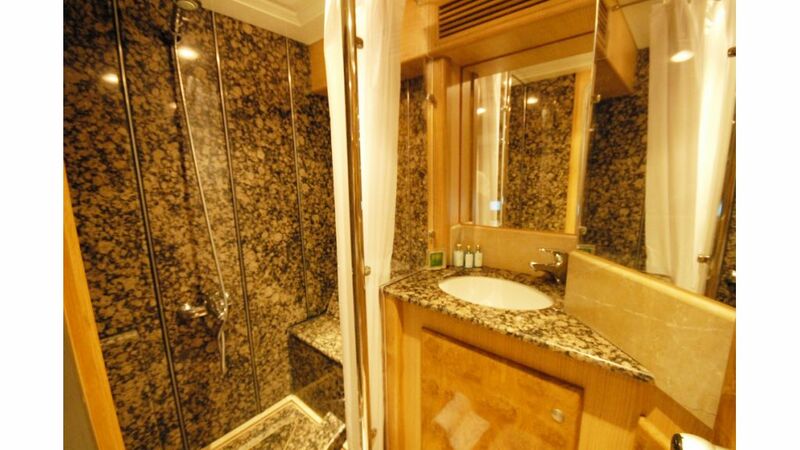 All cabins are fitted with LCD/TV/DVD & Stereos. 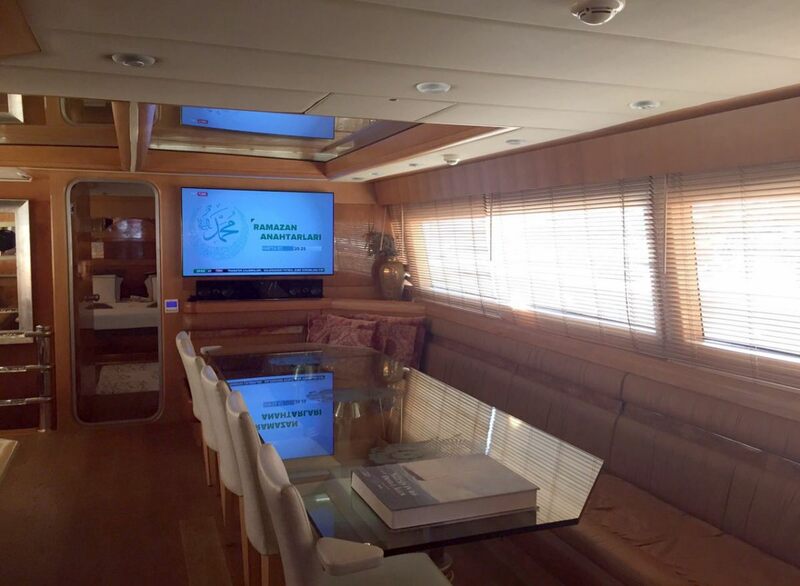 The SUHEYLA Gullet has a Projection screen & cinema system in the saloon, LCD TV/DVD/stereo system in all cabins, DVD & CD library, SATCOM, SAT TV, Deck Spa Pool with ozone treatment & wet bar, Rotating sun deck, Underwater windows & lights to watch the sea life. 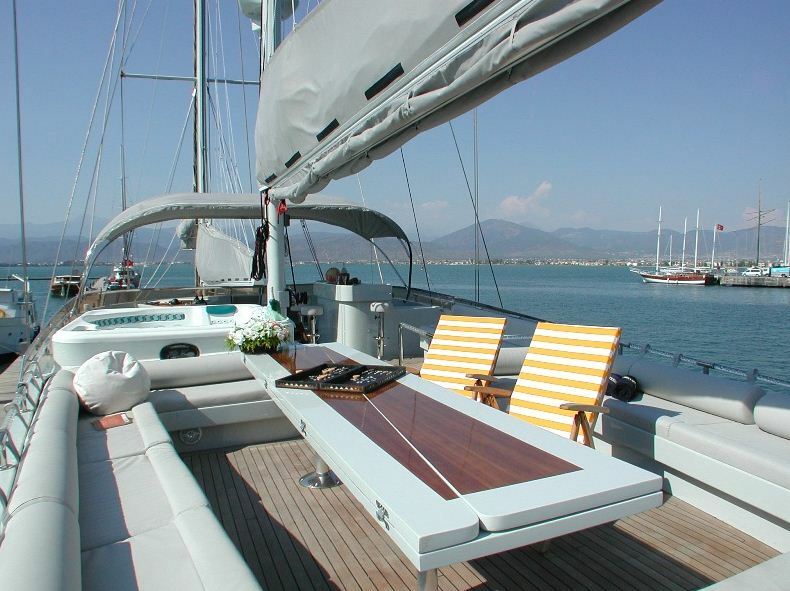 18 sqm water level unfolding aft platform. 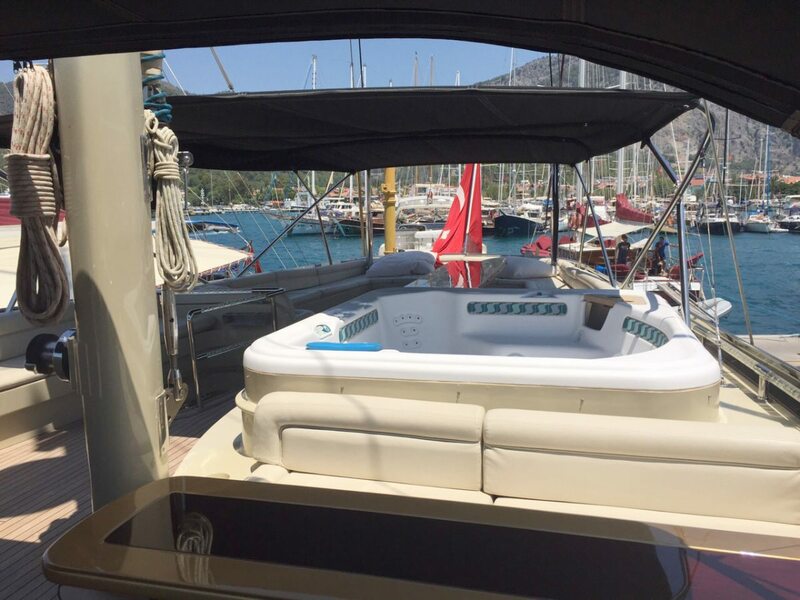 Watersports, Tender Zar 53 with 115hp, Tender 2 - Zodiac 3.20 with 50hp, Water-ski sets for adults & children, Wave runner / wakeboard / Sea-kayak, Snorkeling gear, Fishing equipment, Diving by rendezvous appointment.